Avishi, Vishpala, these are names you may not have heard before. 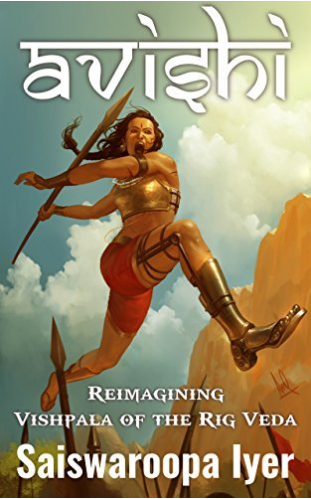 This book talks about Vishpala, a queen mentioned in the Rig Veda, who lost her leg during a fight and then had her leg replaced with a metal one. Saiswaroopa Iyer, the author, has reconstructed Vishpala’s life through Avishi and also imagined some of it, to present before us this wonderful book. Saiswaroopa Iyer has written another book called ‘Abhaya’. Both her books have one thing in common - both talk about tales of women with unimaginable courage. When you start reading Avishi, you will be enthralled by the immense hardships she had to face and her bravery in facing those hardships without flinching. This gives a message to everyone, that women aren’t weak and never were. It dispels that misconception and inspires children who read it. Here is a gist of the story. Sukratu, Avishi’s father, was a soldier who worked at the king’s palace. One night, he was killed in an act of treachery in a conspiracy by General Ugra and his nephew, Khela, and was branded a traitor. Afte rkilling Sukratu, when Sukratu’s assassins came to kill Avishi, she was whisked away by Loha, a beggar Sukratu had taken in. Loha took Avishi to the forest of Naimisha, where all the respected rishis lived. The rishis nursed her and taught her the rules of dharma and how to fight. She grew up to be a warrior. Once grown up, Avishi left the ashrama on Rishi Vahni’s advice and went to a settlement named Ashtagani. She still did not know her past as the shock had wiped that part of her memory. She settled in Ashtagani, got a post as a senior military recruit, and was treated with respect. Meanwhile, in Vrishabhavati, General Ugra had ascended the throne, and Khela was his right hand. Khela plotted with his friend Anudatta and killed his uncle so as to be the king. Khela was not as naïve as the other rulers and planned to change the set of rules that everyone followed. He wants to start by taking over Ashtagani. He started to cut its supplies short. A one-to-one duel where he cheated was called off. To compensate, Khela sent gifts to Ashtagani and offered to marry Avishi, who was now the head of the village. Avishi decided to go to Vrishabhavati, as she had a plan in mind that would help save everyone. She went to Khela’s palace, and later kills Anudatta when he tries to kill her. In the process, her leg is injured, and slowly gets infected. How will she fight to save Ashtagani with her leg? I loved this book more than Abhaya, and it has inspired me. The way Avishi fought even with serious injuries, and her leadership should be a lesson to all of us. Saiswaroopa Iyer is able to alternate from scene to scene with a lot of ease, and none of it seemed abrupt. She was able to build the plot up well, as towards the end when Avishi and Khela fought, I was holding my breath, waiting for how it would end. I loved Avishi and Shivani’s characters the best as both had plenty of courage and would never step down when challenged. They would instead face the challenge and emerge victorious. Each person in the book has his or her own importance, and none of them seem out of place. I think Saiswaroopa Iyer has outdone herself with this book. I loved her idea for the book. There are barely a handful of people who have even heard of Vishpala, and this talks about her whole life! Finding a good topic for the book is also a talent, and writing about that topic, especially if very less is mentioned about that topic is truly amazing. I have loved this book. Why don’t you try it? To know more, Read ‘Avishi: Vishpala of Rig Veda Reimagined’ by Saiswaroopa Iyer. This review was first published in OpIndia (@opindia_com) on Jan 4th, 2018.